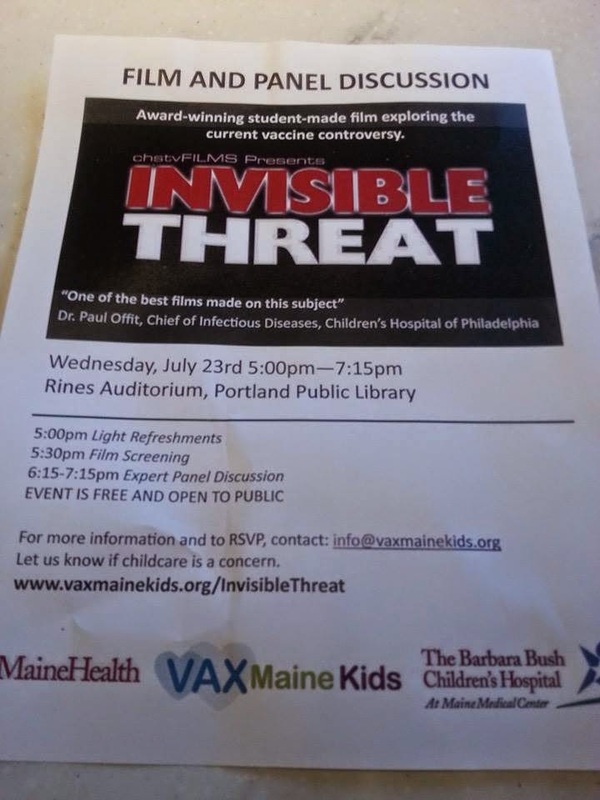 Adventures in Autism: Invisible Threat: Ugh. I know you understand that there are no accidents. A flyer on the wall at the coffee shop you happen to go to, on your way to another engagement? Movie showing right there where you are almost at the same time you are there? No accidents. You are meant to be doing what you are doing. I would be pleased to continue a dialogue with you. As I shared at the event, polarized discussions so rarely yield common understanding and would welcome an opportunity to explore our respective beliefs and truths in dialogue. Please call my research office if you are interested. Just a little note to my fellow Thinking Moms and Dads out there (who choose not to or no longer vaccinate): I want to say something about Dr. Laura Blaisdell. We bring our kids up to see the other doctor in the practice. It is about 35 minutes from our home. I could find a closer practice, but when you find a good doc who helps you do everything and anything to help recover your vaccine injured child - well, you drive 35 minutes. Back to Dr. Blaisdell: we have had the pleasure of seeing her from time to time - even for "well child check ups". Not once, NEVER, has she ever brought up the subject of vaccines. I have never felt pressured, bullied, coerced. She is so respectful and kind & a great listener, I think she really truly meant it when she said she would like to have a dialogue. Just thought I should put it out there. Thanks. Ginger, thank you for representing anti-vaccine parents as a "super angry person." Are you sure you're not being paid by vaccine makers to discredit the the anti-vaccine movement? Desert Farms is always striving to bring you not only the best camel milk around but the most useful information about it products and its benefit to you and your family. Austin is a complex developmental disorder due to a disordered neural development characterized by restrictive, repetitive behavior and impaired social interaction and communication. It usually presents before the age of three years and persists for life. The incidence appears to be increasing in the U.S but is persistently low in other parts of the world. It is thought a combination of environmental, genetic or immunologic factors or dietary factors could be all contributing. There is currently a cast amount of research on the type of milk and its possible contribution to autism. It has been noted that there a substance in cow’s milk that are normally broken down by the gut of the child and excreted normally, but during gut inflammation these substances are believed to be absorbed and may reach the brain and cause disruption in the normal pathways. These substances are not found in human milk and camel milk, which has been found to be the closets substitute to human milk out of all the other consumed milks (cow and goat). Desert Farms strives to bring you the best of camel milk, the most notorious and beneficial milk around.